Developer: Mirai-Labo, based in Tokyo and Madrid. Innovation arrives to the match-3 RPG genre! 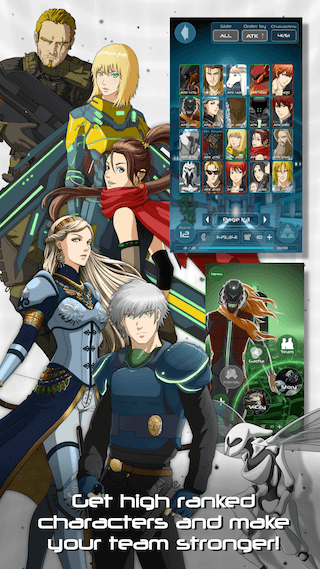 Welcome to the Chain-Action RPG “Phobos Children”! Enemy’s orbs keep falling through the screen, and if they reach your team they will receive damage! Destroy the orbs just tapping over them anywhere on the screen to blow them up. If you destroy three orbs of the same color in a row, you will attack back the enemy! Easy to play but fun and rewarding, you won’t be able to leave until you get a perfect! Keep recruiting new characters for your squad, and make them stronger. Help the main characters in their quest! Classic arcade action-puzzle experience, wrapped on a collection based RPG. Just tap three orbs of the same color: easy to play, difficult to master. Rewards the skilled play, but also the battle planification. Similar to music games and match-3 games, but different. 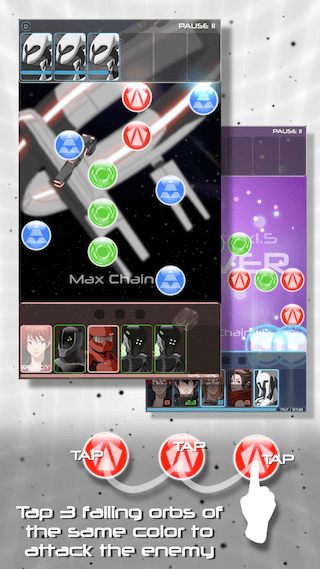 A new style of game based on the classic arcades, specially created for touch screens. About 140 characters to collect and upgrade, and more than 200 missions to complete, with periodic updates. Each mission orb falling pattern is hand-made. More than 450 different patterns so far! There is no random patterns, so the experience is a highly polished. Daily missions, Time limited missions and Events for getting special characters and rewards. Getting perfects on all the missions and complete characters sets gives extra prizes! An engaging story in a sci-fi setting that will bring you to a different world! It mix space opera, cyberpunk and classic fantasy, but reads like a classic adventure. Lightweight, and no extra downloads once installed! The app weights 70 MB, and it won’t grow inadvertently. Our backend system allow us to release new missions and patterns without requiring an update of the app through the App Store. The whole game assets are made in-house: illustrations, music, sound effects, and the background photos. Launched on three languages simultaneously: English, Japanese and Spanish. None of the team members had any experience on game creation, nor art or anything related with content creation. We learned everything from zero. There aren’t any external support from investors or publishers. The team is completely independent. All the tools used for the creation of the game are free: Firealpaca for art, Nanostudio for music, Xcode for programming. The first mockup was made on GameSalad. We are using Parse Server for the backend, BitBucket for git, and GameAnalytics for the metrics. The game was remade from scratch on 2014, after finding the native iOS programing wouldn’t be enough to implement all the features of the game. The game was made on Tokyo and Madrid. The team members communicate using Line, and share files and documents using Dropbox and Google Drive. 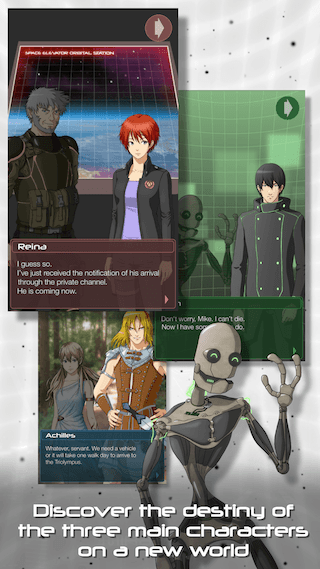 The game appeared several times on big events like Tokyo Game Show and has been featured on websites like IndieGames.com, TouchArcade.com and Famitsu.com. NOTE: Because the game is developed on SpriteKit (an Apple framework), there is no plan to release an Android version for the time being. Daniel Alias (Madrid, 1980), started in 2004 to create the world of “Biomechanical”, provisional name for a world setting planned to harbor a video games series. But in the days before the smartphones, and without any practical knowledge of programming, that was no more than a dream. Ten years later, and some years after moving to Japan, the mobile ecosystem made possible for anybody to try, so the development of “Biomechanical Wars: Phobos Children” (Phobos Children in short) started to become a reality. On 2013 he put together a team of four members from Spain and Japan, and inspired by a shoot’ em up called “Ikaruga”, they made an initial version of the game. The first official presentation was in Kyoto, on the Bitsummit 2014. Regrettably, the performance of the game was not good enough, so it was remade from scratch soon after, on a new (at that time) 2D engine called SpriteKit. In the Tokyo Game Show 2014, the demo of the renewed version was shown, getting a Indie Prize Nomination by Famitsu App. 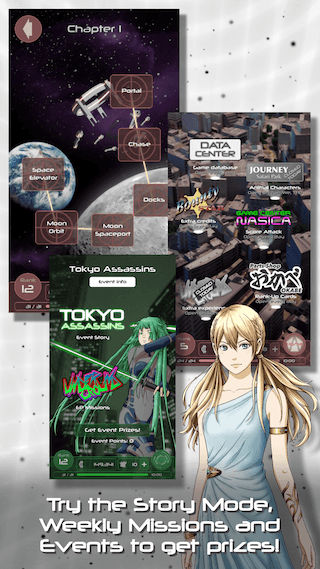 Later, on the Tokyo Indie Fest 2015 and Tokyo Game Show 2015, a revamped user interface was presented to the public. After a whole year finishing the backend (cloud servers and database) and creating content and polishing, and several months of beta testing, the game was finally ready on May 2017. The game has been officially presented on the Tokyo Indie Fest 2017. This is the first experience of the team creating a game. Programming, design, music, illustration, they learned everything from scratch.